It is not by design on our part, that the contributers to this project are descendents of Rev. 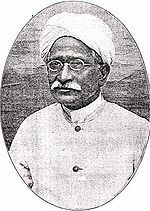 N.Samuel or ஞா.சாமுவேல் (ஞா.சா. ), pastor and theologian in the Lutheran church from 1878. He was a great lover of Spurgeon’s works, and possessed many of his books in his library. After reading John Ploughman’s Talk and John Ploughman’s Pictures, he wrote Ullathu Solvane. Rev. N. Samuel was known as the Tamil Spurgeon, although it is not clear if he was thus known because of his strictness in doctrinal matters or because of his homiletic gifts. His books have mostly gone out of print and we would like to publish them here. He was a staunch Lutheran who was influenced by Pietism. His works are of historical interest and throw light on the state of Christianity in general and Lutheranism in particular in India during his time. You can read more about his life and work here.